This month has seen lots of celebrations occurring across the city from Chinese New Year to 100 years since women got the vote. There has been a lot going on across the city to celebrate. This month's bulletin wants to celebrate the events going on across the city and how carers have got involved. Friday 23 February 2018 saw a very momentous occasion - the opening of a centre for Young Carers in Coventry part of the Carers' Trust Heart of England. The project has been in the pipeline for a very long time, involved a great deal of work and commitment and is hotly anticipated for the Young Carers of Coventry. 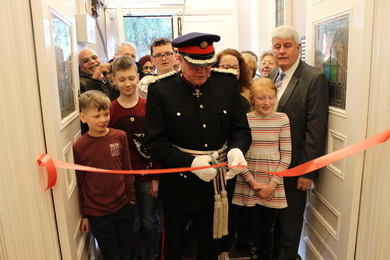 The opening ceremony was attended by chief guest David H Bradnock MBE JP DL FBHI, HM Deputy Lieutenant for the West Midlands, Chairman & Lieutenancy Ambassador for Solihull, the Leader of Coventry City Council, Councillor George Duggins and the Deputy Lord Mayor Councillor John Blundell. The centre will enable the Young Carers Project to continue to support the 1,350 young carers they are already are in touch with and give the opportunity to work with many more through the 52 schools in Coventry that the project already works with. “I am delighted that a long held dream has actually come to fruition. We know only too well the impact caring can have on family carers and none more so than Young Carers, so this new centre will help us to alleviate some of that stress for Young Carers and build resilience.” - Penny Collard MBE - CEO Carers Trust Heart of England. The centre has been refurbished and modernised so that they can offer a wide range of support to young carers with a specially adapted kitchen where they can enhance their cooking skills and enjoy the results. There will be a range of equipment including laptops and iPads so that they can learn and play and do their homework which may not be possible for them at home. There will be an emphasis on supporting the young carers to make friends (they are often isolated because of their caring role) and enjoying activities with other young people in a similar position. During the daytime, while the Young Carers are at school, the centre will be used for meetings and training adult carers. Last year Carers Trust supported 450 adult carers with training in skills to help them in their caring role and reduce their stress. During the evenings it will be used as a youth club for teenagers with disabilities to complement our STARS club service for children with disabilities. Future plans for the centre include a drop in for people with disabilities and their carers to respond to the need for short term breaks for carers. “It's an amazing space and we will be able to do so much more than we did at the old building and it's all on one level, so more accessible too. We can't wait for you to see it”. - Mark Graham - Young Carers Family Information, Advice and Support Worker. Young carers are people aged between 5 and 18 years old who have a responsibility for looking after or helping someone else to look after a person who has a disability, a long term illness, mental health illness, Autism/ADHD or someone addicted to drugs or alcohol. That person could be your mum, dad, brother, sister, grandparent or even a close friend or neighbour. As a young carer you may help out by going shopping, cooking, cleaning, making sure the person you care for takes their medicine, talking and listening to them when they are not very happy, look after brothers and sisters or anything else that helps out at home. Carers Trust Heart of England can help young carers by listening to them when they need to talk, giving them information and advice and support, arrange trips and activities to give them a break from your caring responsibilities and support you through any troubles you may have in school. If you are a young carer looking after a family member you can contact The Coventry Young Carers Services on 024 7610 1040 or visit the website: www.youngcarerscoventry.com for more information. Jinseon Korean BBQ Restaurant, Fairfax Street in Coventry on 20 February 2018. 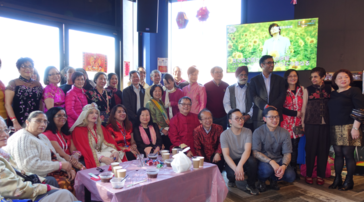 The event was organised by the Chinese Carer Support Service of Carers Trust Heart of England (formerly Coventry Carers’ Centre). There was a wide range of entertainment including celebration songs, dancing and lots of delicious oriental dishes. Lady Godiva, Pru Porretta, and other honourable guests joined in the celebrations. The Chinese “Kung Hei Fat Choi” means 'Happiness and prosperity!' Each Chinese New Year is characterized by one of 12 animals, which appear in the Chinese zodiac. This is divided into 12 blocks (or houses) just like its western counterpart, the major difference being that each house has a time - length of one year instead of one month. In addition, each animal sign is associated with one of five elements: Gold (metal), Wood, Water, Fire or Earth. For more information about the Chinese Carers Group contact the Carers Trust Heart of England on 024 7610 1040. Coventry's Special Educational Needs and Disability Information and Advice Service (SENDIAS) are holding a free event for carers of those aged 14-25 who want to learn more about increasing independence and understanding what services are out there in the community. There will be contributions from Direct Payment services, home adaptations and community groups, there will also a range of support agencies to meet with. The event will be held on 22 March from 10.00am-2.00pm. To book a place please email iass@coventry.gov.uk or 024 7669 4307. Carers' Coffee Morning which is usually held at Central Library will be held at St Mary's Guildhall (Drapers Suite) on 14 March at 10.30am. It’s simple! Just add your email address in the top right hand corner and click GO! You can also sign up or view previous bulletins from our Carers' website. If you have any comments or wish to contribute something to the next bulletin, please let us know by contacting us at carers@coventry.gov.uk.